As 2015 heats up, we continue to see a rising demand to make ordinary backyards extraordinary and luxurious, with homeowners typically favoring two distinct approaches: modern and natural. Modern luxury backyards draw on the established tradition of modern with clean lines, sophisticated but simplistic water features and crisp monochromatic tones, particularly grey, black, beige, and, of course, white. Backyards designed with natural luxury in mind are more organic, incorporating curves, warmer colors in the earth tones range, and natural materials. Those wishing to incorporate a modern luxury outdoor space will most likely include clean straight lines in their swimming pool design as the focal point of their private oasis. You can increase the luxury factor by adding a knife edge (also known as a vanishing or invisible edge) on one or more sides of the pool, which makes the water appear as if it is even with the top of the pool, creating an attention-grabbing illusionary effect. 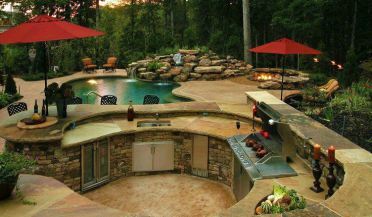 A quality pool builder can also incorporate gorgeous water features into the catch basin where the pool water overflows. Pool finish colors for the modern luxury backyard range from deep blues to neutral greys and quality glass tile, especially European glass, is a preference among many. No natural luxury outdoor space is complete without water, but for a nature lover, the pool should fit seamlessly in the natural world. Again, a builder with knowledge and experience can integrate a pool with curves, emphasizing the shape and space of a yard, while making an organic fit with stones and tiles in the greens and browns of an earth tone palette. Flagstones and Italian marble both add nature-inspired distinctive looks. 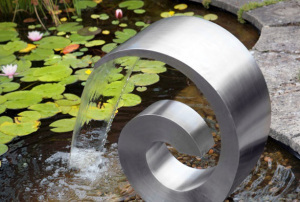 In either case, water features are a must, the perfect way to add the tranquil sounds of moving water to one’s relaxation. 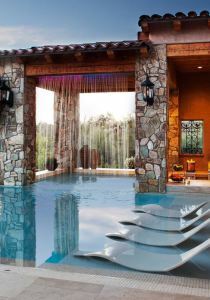 Rain waterfalls can be incorporated into the pool in an endless variety of ways, from free-form styles to more modern features that give the illusion of a wall of water. Waterfalls also punctuate an outdoor space in a stunning way when used as standalone features that offer an eye-catching focal point. Fountains are another classic, timeless option that never seem to go out of style, versatile enough to be both elegant and playful. Built-in side wall rain curtains can offer soothing water sounds with a subtler understated effect, with European faucet-inspired features offering a particular chic, modern finish. All this can be wrapped in decking options that are just as vast as those for interiors. There’s classically inspired Italian marble, traditional concrete which has been reinvented and reinvigorated with an array of decorative finishes, flagstones with their naturalistic feel, along with innovative options like composite decking or artificial grass. 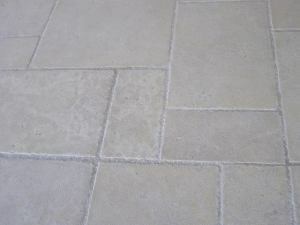 Those seeking to bring a little order to nature will love travertine pavers, which offer the durability and beauty of marble and flagstone, but the dramatic design flexibility of pavers. Adding the inviting warmth of a fire assures that your spectacular luxury space can be enjoyed anytime of the day or night. 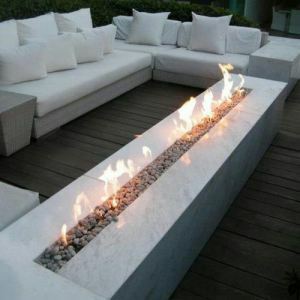 Of course, nothing could be more dramatic than coupling fire and water features by, for instance, insetting gas jets in the top of a side wall water feature, but if you’re looking to create the inviting ambience of an evening gathering place, you’ll want to shift attention after dark to a fire bowl or fire table, versatile enough to be modern or naturalistic, simply based on the materials. Then again, why not simply bring the fireplace outdoors for a nighttime focal point that offers that comforting oasis of enjoying a fire in the dark. 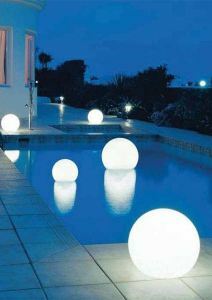 Of course, if you’re looking to light up the night, consider the impact of novelty lighting. Floating pool lights add a whimsical touch to a night swim, while DMX-controlled lights give you the opportunity to orchestrate your own private light show! LED accent lights can create new focal points and highlights after dark or simply help keep everyone safe, but for lots of late-night get-togethers, consider choosing hanging lanterns or chandeliers. Available in every style, from elegantly simple to ornately romantic to strikingly modern, these lighting selections work best in places people gather to talk and unwind. And if gathering and entertaining are the inspiration for an updated backyard and space permits, consider a gazebo for lounging shade lovers, a pergola, which can easily have either a fabric or metal panel roof over the kitchen or seating areas, or go all out on a custom space to get the perfect space that will draw your guests together in comfort. 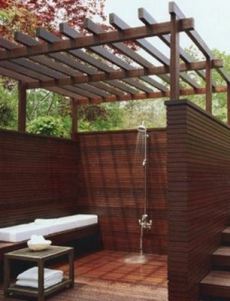 Regardless of the choice, be sure to add an outdoor shower, either on its own or as part of a custom build. With an outdoor shower, just add a kitchen and you’ll never need to go indoors again! No host or hostess wants to lose out on time with guests and with an outdoor cooking area, you can prep and party all at the same time. No backyard is complete without a gas grill, but a luxury space can offer so much more – pizza ovens, rotisserie racks, smokers, anything the serious backyard barbecue aficionado could desire! All the standard kitchen amenities like a stainless steel fridge with ice maker, a spacious sink with garbage disposal and stainless steel cabinets make sure that everything is within reach, so entertaining will look and be effortless, and counters in granite, tile, marble, or stack stone, skewing grey or neutral for the modern backyard or toward ivories and earth tones for a natural one, make preparation and cleanup so easy. Meanwhile, keep guests’ glasses full by adding a wine or beverage chiller and to make your personal oasis feel like a real tropical getaway, a swim-up pool bar is a must. But convenience and technology aren’t limited to the kitchen! 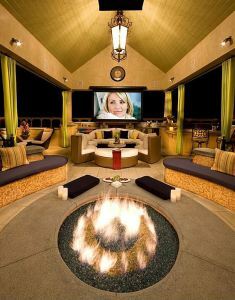 Outdoor televisions allow you to watch the big game in a much more versatile place than a crowded living room, while projector screens take family movie night to a whole new level. Audio systems for the backyard offer everything that home theater systems do and a quality custom job can make sure speakers are well-positioned and well-hidden. You can even add underwater speakers – and then pull the whole thing together with the seamless effortlessness of an automated remote-controlled system. After all that, it’s time to kick back, relax, and enjoy it all in a comfy seat! Outdoor furniture offers as many options as indoor these days, with classics like cast iron furniture rrfurniture4and wicker and more modern choices like aluminum and teak, with limitless fabric options. Modern palettes favor whites, creams and ivories, while more naturalistic looks tend toward teals, lime greens, or orange hues – or simple splashes of accent colors against the larger earth tone color scheme. 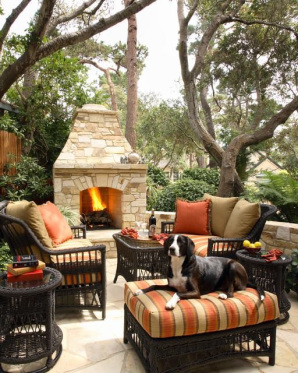 If space allows, having formal seating areas clustered together makes a backyard versatile enough to nest4accommodate small, intimate parties or larger informal gatherings, while tucking a stylish European-inspired seating area away in a private or hidden corner also makes a lovely place to get away from it all for a few moments. 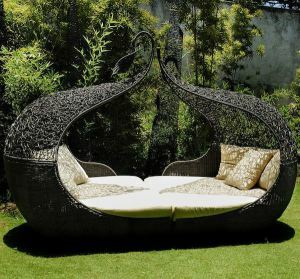 Then there’s always the ultimate hideaway: nest furniture. Nest furniture, standard or hanging, creates just that, a cozy nest-like nook that offers a calm retreat, the perfect place to curl up with a good book. Hanging furniture is also available in a variety of other forms, turning every seat into a swing. Regardless of the choice, choose wisely and settle in because there’s no better place from which to take in the view and enjoy your newly transformed backyard! Luxury comes in every shape, size, style and color, so to learn how you can transform your own backyard from ordinary to extraordinary and to locate products and builders, contact Stacy Nelson from @BackyardMamma at 844-368-4769 or email stacy@BackyardMamma.com. Ms. Nelson has more than a decade of experience in the outdoor living and swimming pool industry and sources luxury products to builders and educates consumers about backyard living design and products.